This sheet offers the modeller 9 decal options. 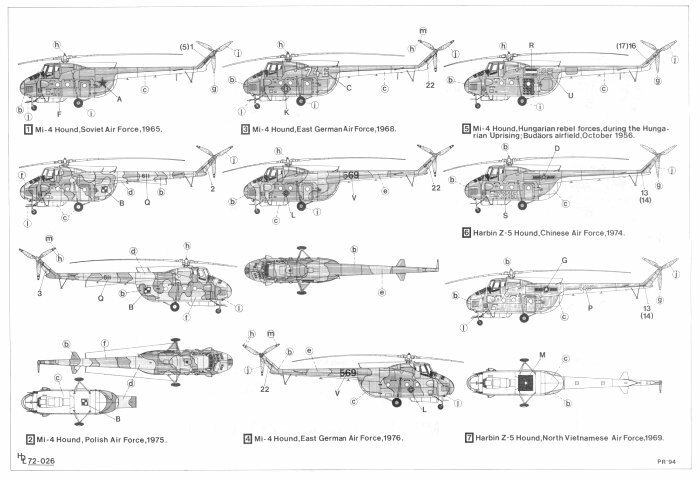 There are enough stencils included to do one of the 9 helicopters featured on this sheet, although with additional stencils all 9 helicopters could be made. The first decal option is for a Soviet Air force Mi-4 in 1965. This chopper is Dark Green (FS 34102) on the topside and Light Blue (FS 35526) in the underside. Same colours as the third decal option with the picture of the model below. The second decal option is for a Polish Air force Mi-4 in 1975. This chopper is a three colour camo paint scheme on the topside including Dark Green (FS 34102), Ochre (FS 33440) and Sea Grey (FS 36270) with Light Blue (FS 35526) in the underside. The third decal option is for an East German Air force Mi-4 in 1968. This chopper is Dark Green (FS 34102) on the topside and Light Blue (FS 35526) in the underside. 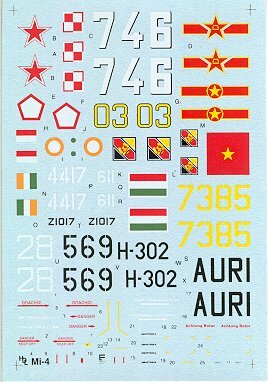 The fourth decal option is for an East German Air force Mi-4 in 1976. This chopper is a two colour camo paint scheme on the topside including Dark Green (FS 34102) and Dark Brown (FS 30117) with Light Blue (FS 35526) in the underside. The fifth decal option is for an Mi-4 Hound of the Hungarian Rebel forces from Budaors airfield during the Hungarian Uprising in 1956. This chopper is Dark Green (FS 34102) on the topside and Light Blue (FS 35526) in the underside. Same colours as the third decal option with the picture of the model above. The sixth decal option is for a Harbin Z-5 Hound of the Chinese Air Force in 1974. This chopper is Dark Green (FS 34102) on the topside and Light Blue (FS 35526) in the underside. Same colours as the third decal option with the picture of the model above.  The seventh decal option is for a Harbin Z-5 Hound of the North Vietnamese Air Force in 1969. This chopper is Dark Green (FS 34102) on the topside and Light Blue (FS 35526) in the underside. Same colours as the third decal option with the picture of the model above. The eighth decal option is for a Mi-4 Hound of the Indian Air Force in 1965. This chopper is Light Grey (FS 26492) all over. 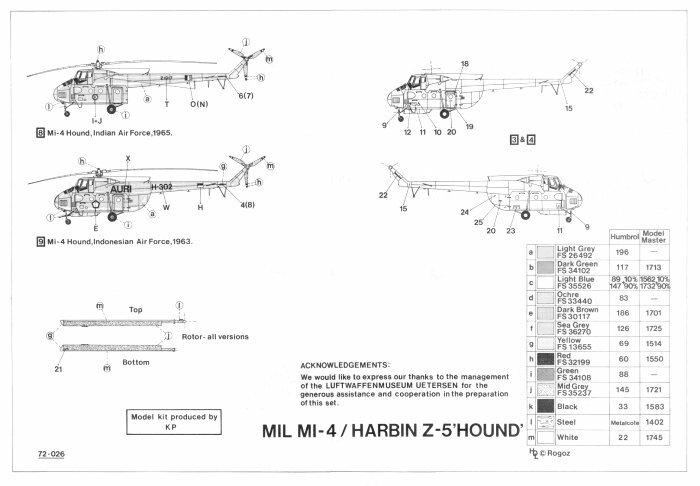 The ninth decal option is for a Mi-4 Hound of the Indonesian Air Force in 1963. This chopper is Light Grey (FS 26492) all over.